My infographic on communication was misunderstood by some. Fortunately, it was not universally misunderstood. In fact, most people "got it". Nevertheless, I'll expound on it, because that's what I tend to do. An expert will tell you that there is a difference between language and communication... that language refers to the vocabulary and the grammar that we use to express concepts; and that communication refers to the sharing information. You can have communication, for instance, by non-verbal means. My cat is perfectly capable of telling me when she's hungry, or when she wants out. She doesn't need language for that, any more than you yourself need language for basic communication. But language requires communication if it's to work. If you don't have all of the above, you're not communicating. Keep in mind as you read this that I'm talking about the simplest case of a single message. In dialogue, there are multiple senders and receivers, transmitting multiple messages and feedback criss-crossing each other, sometimes asynchronously. Dialogue can be complicated, but in every case, with every message, it's composed of simple message loops. Keep that in mind: a message loop is simple. You can make some very impressive structures using only the simplest Lego bricks. Likewise, even Albert Einstein was a collection of single cells. Let's say you are the Sender, so we're aligning this discussion with that graphic. As the Sender, you're the one who owns the message. It originates in your head. You are the one who knows it in its entirety. Since you own the message, you have the responsibility for phrasing it properly. No one else. And you hold the responsibility for failing to do so. The receiver doesn't know the message. You can't depend on him to "fill it in" for you. He doesn't have it. He lives in a different skull. He can try to fill in the message from his experience, but he's not obligated to, and that's prone to failure anyway because it is basically guesswork. You cannot depend on someone else's guesses to accurately communicate your message. That's the reason we need feedback, which we'll talk about shortly. The message can be almost anything. It can be a stop sign, an advertisement, a verbal sentence. In its simplest form it is the transmission of one thought. Multiple thoughts require multiple loops. Now in my previous post I noted that "when your words are universally misunderstood, the failure lies not with the listeners. YOU used the wrong words." That's 100% right. You don't have to take it as an accusation either... it's merely factual information you should use to refine the message. If you're an adult talking to a child, you should use words a child can understand. Specifically, you should use words that your target child can understand. If you're writing an ad intended for Mexican consumers, you should write it in Spanish. If you're writing Business Requirements for a computer program, you should avoid technical jargon. It's actually a little broader than words. Far more things go into a message than you might think, particularly if it's delivered in person. Your demeanor, your dress, your grooming, your mannerisms, your facial expressions, and even your past statements all define the context for your message. And it's important to remember where your audience is. That's why I don't list the medium (or channel) separately. The medium and the message are one. Try looking at it this way: neither the message nor the medium is the thought. Each is intended to convey the thought, and each answers the same question: "How will I say this?". As for the message I sent above, I did not publicly identify the receiver. That was deliberate. In part, it's because embarrassing the recipient was not part of my message. In part, it's because I feel the message is broadly applicable. In part, it's because I wanted to see if the receiver recognized himself. Judging from emails and private messages, a number of people thought it applied to them enough to say so. I got the feedback I was looking for, and in the case of the intended recipient as well as others, the message was understood. Have you ever tried talking to someone who doesn't even acknowledge your presence? Frustrating, isn't it? Feedback is a necessary component of communication. In the case of a blog such as this, or radio, etc., the feedback can be delayed or indirect. For instance, I get feedback in the form of comments, emails, and analytics that count the number of visitors, their geographic locations, and referring sources. A radio station may get feedback in the form of listener calls, letters, and emails, and advertising sales. But it has to exist. Of the four components I'm describing, feedback is the least recognized. Nevertheless, to a castaway on a deserted island, a message in a bottle is merely an attempt at communication, whereas a rescue defines success. Now, you don't have to feel bad if 100% of your audience doesn't get the message at first (unless it's an audience of one). In every crowd there will be someone who doesn't follow the conversation. And you don't have to feel bad if those who do comprehend the message do not agree with it. "Agreement" is not what feedback is about. "Understanding" is. Let's look at our original infographic again. 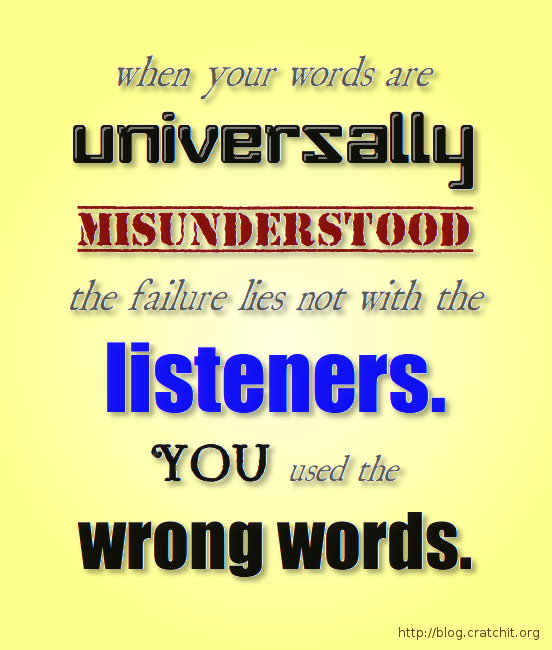 How do you know that your words were misunderstood? Only through feedback. Feedback is necessary because it not only tells you whether the message was received and understood, but because it can tell you more about your audience than you knew at the start. This allows you to refine your message, choose the right words. and try again. Feedback is only useful if you act on it, which is why I'm mentioning "iteration" as the "fifth element" that doesn't appear on my diagram. Just as communication is dead when you have no feedback, it's likewise dead when you ignore the feedback you have. In more complicated communications, such as conversations, the other person talking isn't to give you an opportunity to rest up. It's for you to pay attention. And that's what my infographic is really about. By listening to feedback you can choose the right words and get your message to the receiver intact. It's not an accusation. It's advice. So why did I bother to post this when so much has been said by so many about communication? One big reason is that although the Wikipedia article on Communication says, "Feedback is a critical component of effective communication," it only mentions the word two times (one of which I've just quoted), and for further information links to an article on feedback in engineering contexts that have little to do with communication. I wasn't kidding when I said feedback is the least recognized component. That's no way to treat something that's critical. This post utilizes graphics adapted from those contributed to Wikimedia Commons by user East718.